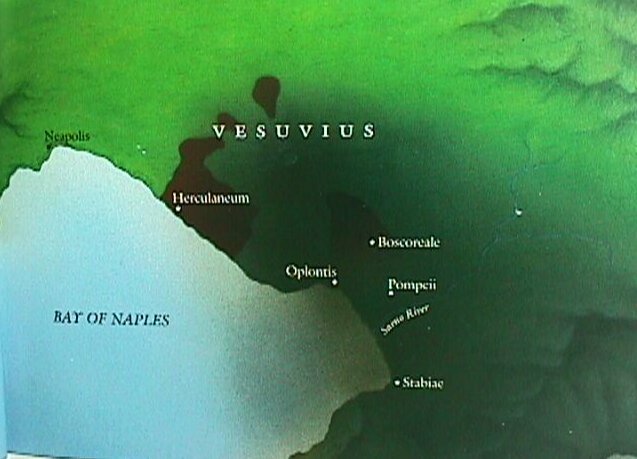 Pompeii 79 CE:Context: Pompeii- on August 24, 79 AD a volcano on Mount Vesuvius erupted and buried two entire Roman resort towns near the coast under thousands of tons of volcanic ash. Poison gas was sprayed into the air and as it went down the heated gas killed all the people. 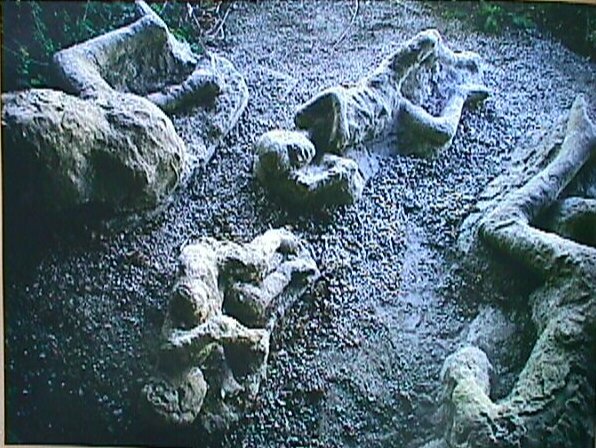 The bodies which were covered with volcanic ash were destroyed but left a type of fossil impression in the dried ash and lava. The result was that the town and some of its people were completely preserved for archeologists and historians to uncover later. From the remains of the city we know how the people looked like, how they lived and how they did business. They had organized business and residential districts and paved streets. They even had hot and cold running water. The houses that were preserved by the ashes have left us with a good idea of what kind of lifestyle these people might have lead. 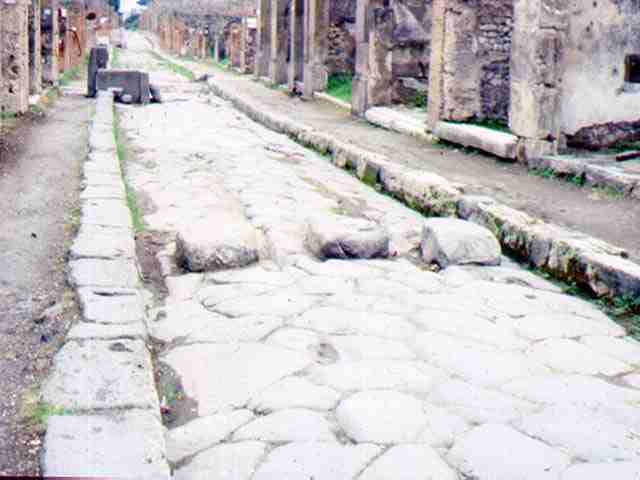 Street in Pompeii with stones for walking across. Form: The cobbled city streets had drainage ditches, sidewalks and were laid out in a standard size because axle lengths were standardized throughout the empire. The standardized sizes allowed the installation of walkways (the three stones across the street) that would allow pedestrians to walk above the street when it was filled with rain and avoid the horse poop and mud. The stones also acted as a kind of "speed bump" because the carts would have to slow down to enable themselves to move through the ruts. Iconography: The cliché "all roads lead to Rome" applies here in the idea that the Romans really believed that a solid civic infrastructure symbolized order and civilization. 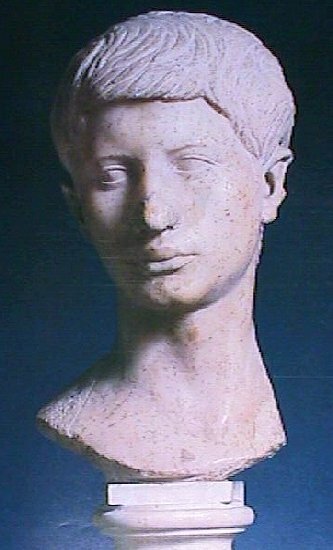 plaster with traces of encaustic paint Form: The veristic style of the Roman Patrician above is also expressed in Roman portrait busts. According to Gardner, the Romans, unlike the Greeks, believed that a sculpture of the head alone was enough to fulfill the requirements of creating a portrait of an individual. The Greeks believed that one needed the whole body for an accurate portrait. Nevertheless, in each of these busts, every feature is recorded faithfully, but, the age of the sitter and the verism of the portrait was probably influenced somewhat by the gender of the sitter. This sculpture was originally part of a larger figure that was hurt or destroyed in an earlier earthquake or eruption. The head was preserved and placed on a stand however the nose had been broken off. The broken nose was replaced with a bit of plaster to fill in the broken off portion. Iconography: These home/shop organization was integral to and symbolized the economic health that supported the infrastructure of Rome and its towns. To own such a home in itself demonstrated the wealth and prestige of the landlord. The types of shops fronting the homes was also up to the discretion of the zoning of the town as well as the homeowner who lived behind the shop. 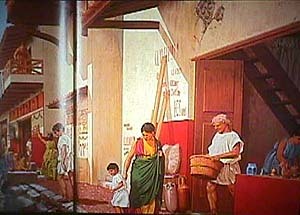 Form: The typical atrium style house of Pompeii was fronted by the shops (1). 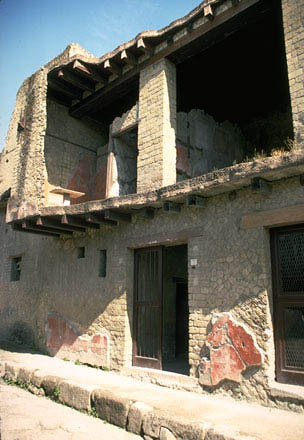 The structure usually housed a main house and sometimes even an additional ones (7) was rented out. 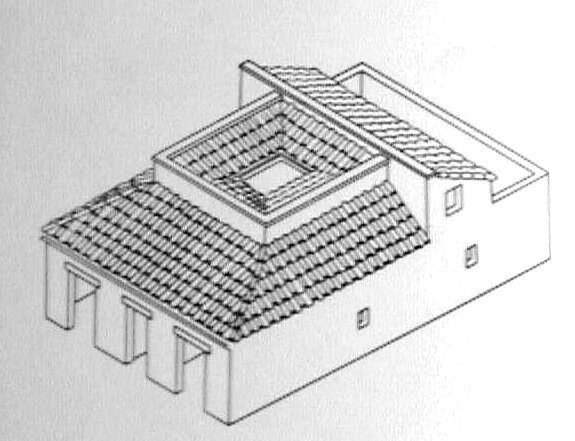 The fauces (latin for throat) or vestibulum (2) was a thin passageway that led into the atrium (8) in which the an open skylight above the atrium caught fresh water. 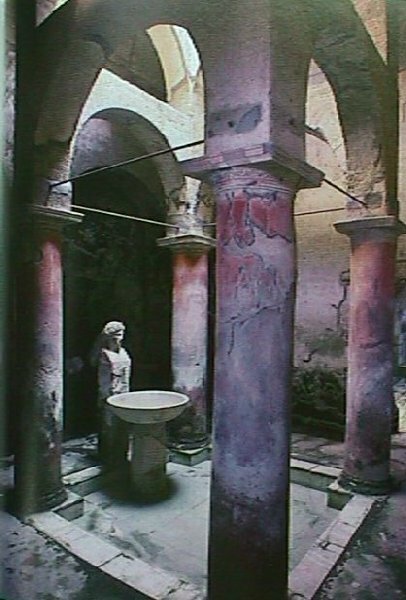 A similar open air peristyle courtyard (9) was located further in and the bedrooms, dining room, bathrooms, kitchen and other service areas radiated out from. A vegetable garden in addition to the the flower garden provided delicacies such as fresh fruit and staples such as vegetables.Context: These atrium style houses were really apartment houses and commercial districts combined into one structure. As such, they were an incredible investment for the wealthy owner. 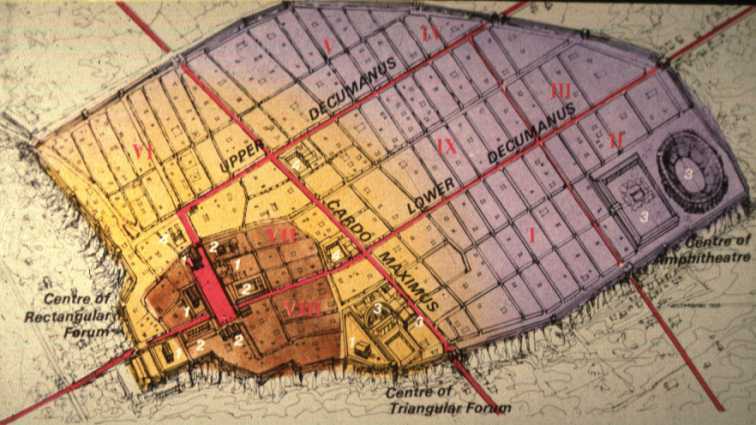 Not only were they self sufficient in terms of food, the rental on the shops and additional dwellings often paid for whatever loans and taxes owed on the complex. Style House. 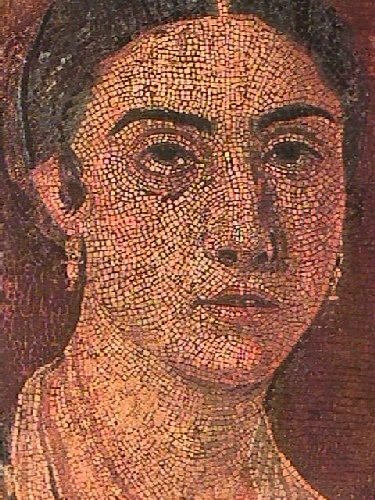 Form: Mosaics were made from small blocks of stone, ceramic tile or glass called tesserae. These blocks were then pushed into either plaster, for walls, or cement, for floors. The blocks, when placed together combined together like the pixels on a computer screen to make an image. When one looks at the the images from a distance the blocks of color one next to the other mix because the eye would blend them together. This is called optical mixing. Depending on the skill of the workman/artisan, the work could be extremely realistic of cartoonish. These were a particularly durable form of decoration as they were impervious to staining and fading. Further up in this photo you can see the impluvium (pool) of the atrium. Iconography/Context: The location and subject of this mosaic makes a lot of sense. The image of the dog in the front hallway is apotropaic and roughly the equivalent of an alarm sticker on a window or "beware of dog sign." 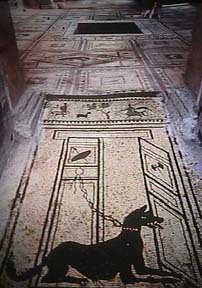 In fact some mosaics are accompanied with the latin "cave canum" which means literally translates "beware of dog" and indicates a high degree of literacy if they expected a thief to be able to read the warning. 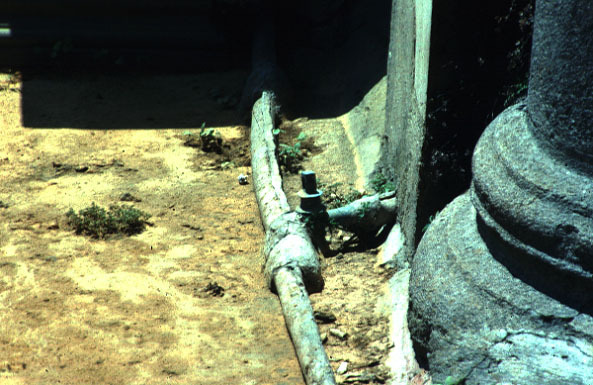 The lead pipes which moved the water through the houses. The next stop in the house was the atrium. 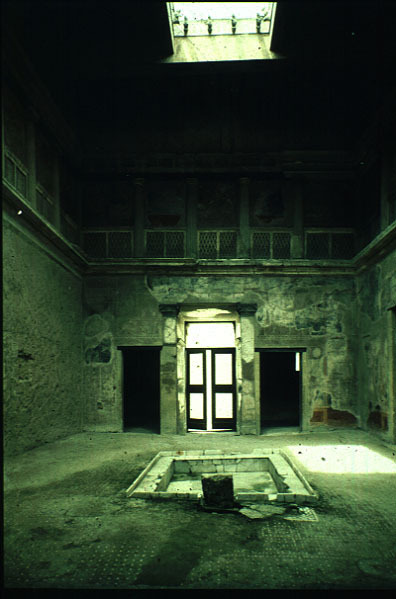 The latin word for heart or chamber is atrium and this room is where the water was gathered from an opening in the ceiling and then collected further back in the house in a cistern. 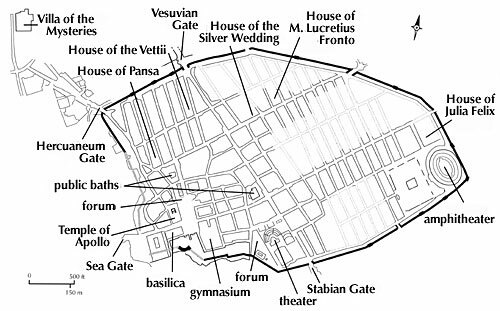 In the center of the atrium was the impluvium or pool that collected the water. In the image on the left you can see a fountain and a sink. This room, as almost every room in the house, had a mosaic floor, and frescoes on all the walls. Depending on the home, some rooms even had special themes and addressed specific stories. 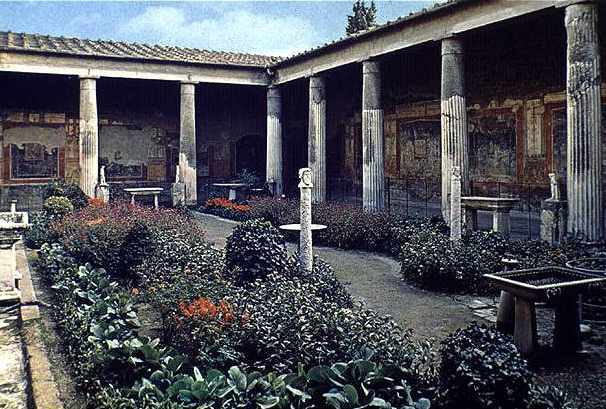 Peristyle Court at the house of Vetii Form: These peristyle courtyards had ornate sculpture and flower gardens surrounded by a perimeter of stylos (latin for column). The perimeter columns held up the roof overhang under which furniture was placed. The columns were often made of marble and often there was marble veneer on the concrete and brick wall. 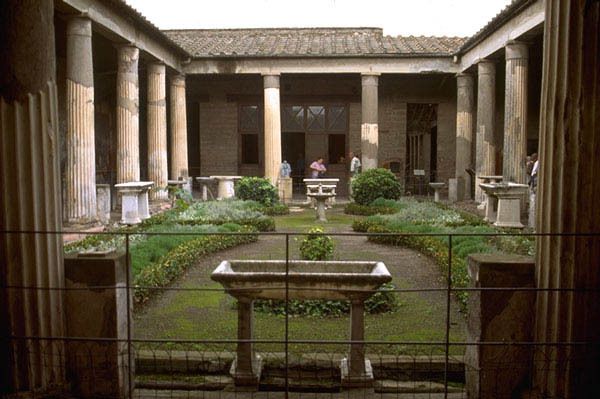 The wall of the courtyard were often decorated with mosaics and or fresco.Iconography/Context: The peristyle is almost misnamed because it is truly the atrium (latin for heart) of the house. This is where the family gathered and in essence it was an outside living room. Here air and light flowed through the space but the occupants would not be bothered by the noises and smells of the street. The image on the top is a fresco. Fresco is a term that literally means "fresh." 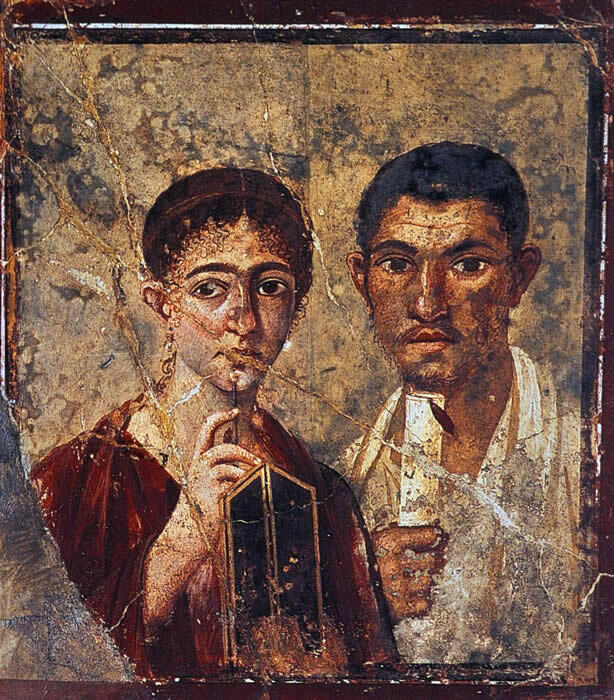 There are two kinds, buon fresco and fresco secco. 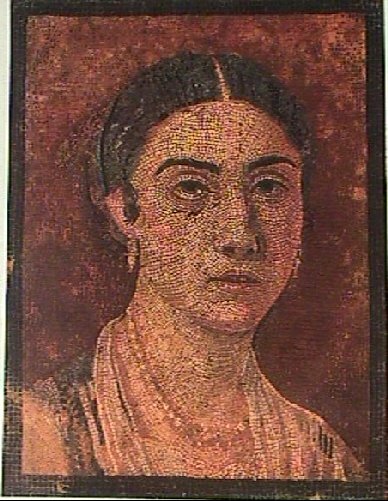 This painting painting is made by coating a wall with plaster and while the wall is still damp, ground up pigments are mixed with water and lime and painted on the wall. The paint soaks in and literally stains the wall up to a half an inch and becomes permanent. This is called buon fresco (good fresh). Details with more expensive colors (such as blue made from lapis lazuli) are added with tempera paint (egg yolks and glue) when the fresco is dry. This is calledsecco fresco (dry fresh). 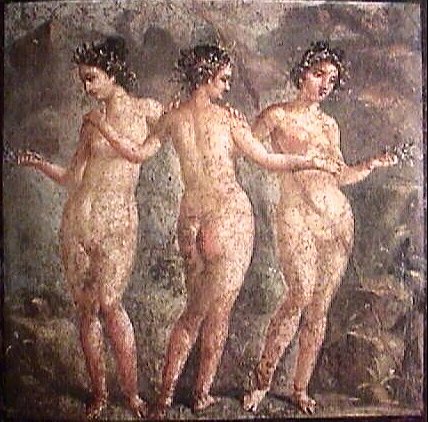 Fresco from Pompeii before 79 CE Formal: These two frescos depict idealized human figures, all standing in the classic contrapposto pose, rendered with light and shadow. The use of light and shadow, or value structure, to depict volume is sometimes referred to chiaroscuro. Chiaroscuro literally translates into Italian as light and shadow or dark and light. 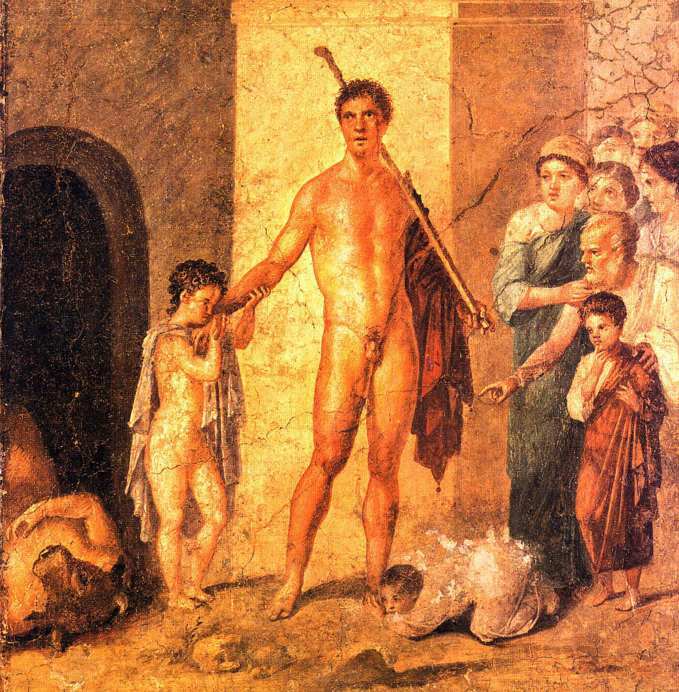 In the fresco depicting Theseus and the minotaur with the Athenian youths, is fairly complex in how it depicts space. 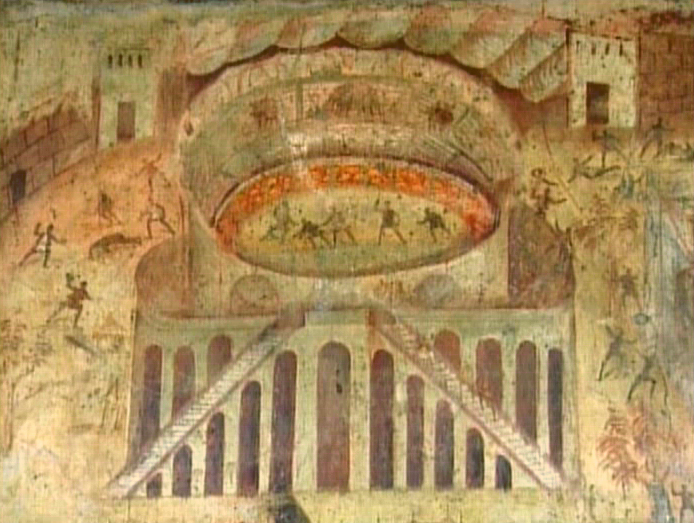 For example, the figures are placed in and around an architectural structure and the body of the Minotaur is depicted in a foreshortened pose. As the head and torso of the Minotaur project into the foreground they begin to look shorter than if the view was a strict profile view. 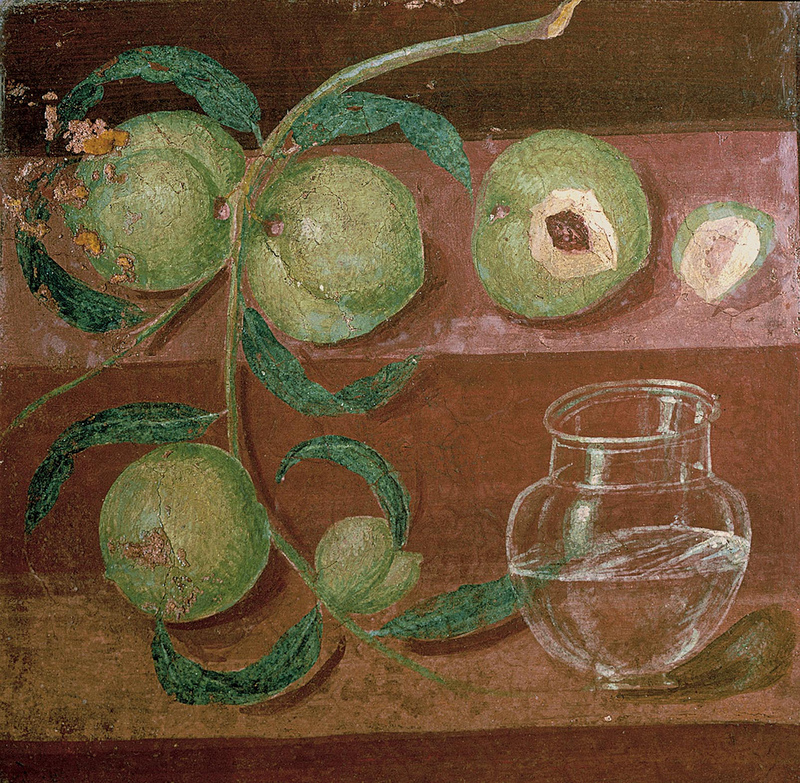 Fresco is a method of painting water-based pigments on freshly applied plaster, usually on wall surfaces. The colours, which are made by grinding dry-powder pigments in pure water, dry and set with the plaster to become a permanent part of the wall. Fresco painting is ideal for making murals because it lends itself to a monumental style, is durable, and has a matte surface. 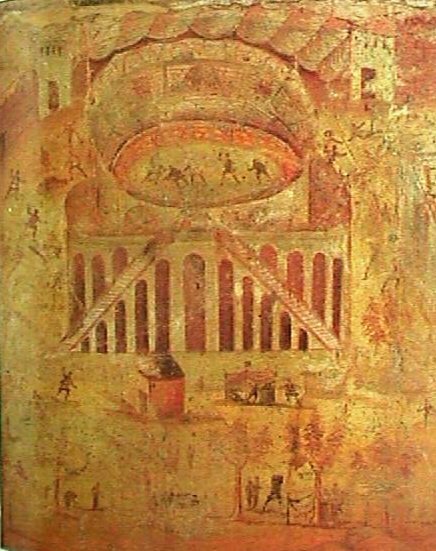 Buon', or "true," fresco is the most durable technique and consists of the following process. Three successive coats of specially prepared plaster, sand, and sometimes marble dust are troweled onto a wall. Each of the first two rough coats is applied and then allowed to set (dry and harden). In the meantime, the artist, who has made a full-scale cartoon (preparatory drawing) of the image that he intends to paint, transfers the outlines of the design onto the wall from a tracing made of the cartoon. The final, smooth coat (intonaco) of plaster is then troweled onto as much of the wall as can be painted in one session. The boundaries of this area are confined carefully along contour lines, so that the edges, or joints, of each successive section of fresh plastering are imperceptible. The tracing is then held against the fresh intonaco and lined up carefully with the adjacent sections of painted wall, and its pertinent contours and interior lines are traced onto the fresh plaster; this faint but accurate drawing serves as a guide for painting the image in colour.